De behandeling van zowel acute als chronische virale infecties is zowat braakliggend terrein in de reguliere geneeskunde. Er is weinig aandacht voor in de medische opleiding: op symptoombehandeling na zijn er nauwelijks protocols. Naast sanitatie wordt alle hoop gesteld op vaccinatie en antivirale middelen, maar die zijn duur en nauwelijks effectief, en hebben veel ongewenste effecten. Digitale versie: Vasquez A. Antiviral Nutrition. 2014;10 + regelmatige updates. 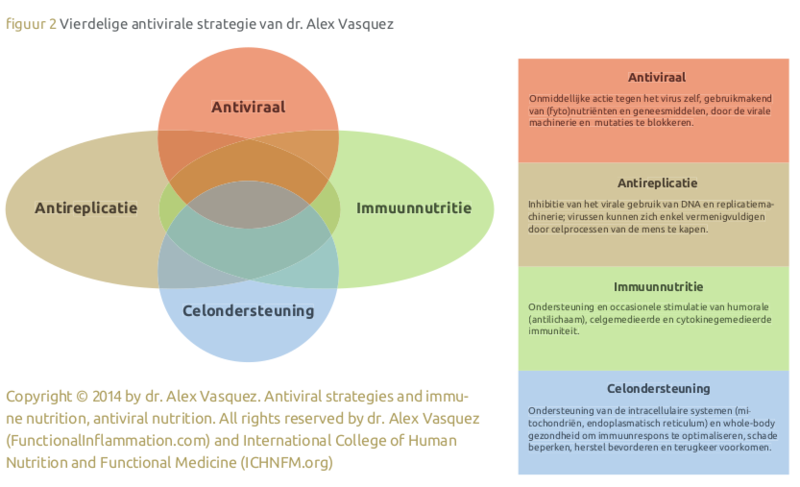 Vasquez A. Antiviral Strategies & Immune Nutrition/ Antiviral Nutrition/ Rheumatology v5.3. Moroncini et al. Role of viral infections in the ethiopathogenesis of multiple sclerosis. Clin exp Rheumatol 2013; 31(2 S 76):3-7. Farina et al. Epstein-Barr virus infection induces aberrant TLR activationpathway and the fibroblast-myofibroblast conversion in scleroderma. J Invest Dermatol 2014; 10(7):954-64. Onuora S. Connective tissue diseases: Epstein-barr virus in Sjögren’s syndrome salivary glands drives local autoimmunity. Nat Rev Rheumatol 2014; 10(7)384. Ball et al. Intracerebral propagation of Alzheimer’s disease: strenghtening evidence of a herpes virus ethiology. Alzheimers Dement 2013; 9(2):169-75. Powers et al. High prevalence of Herpes simplex virus DNA in temporal arteritis biopsy specimens. Am J Clin Pathol 2005; 123(2)/261-4. Brocollo et al. Possible role of human herpesvirus 6 as a trigger of autoimmune disease. ScientificWorldJournal 2013 Oct 24;2013:867389. Mohammadi et al. Association between human papillomavirus DNA and temporal arteritis. BMC Musculoskelet Disord 2012; 25;13:132. Melo Gomes S et al. Vasculitis following HPV immunization. Rheumatology (Oxford) 2013; 52(3):581-2. Shimomata et al Human parvovirus B19-induced acute glomerulonephritis: a case report. Ren Fail 2013; 35(1):159-62. Radic et al. Infectious disease as aetiological factor in the pathogenesis of systemic sclerosis. Neth J Med 2010; 68(11):348-53. MitchellBM, Font RL. Detection of varicella zoster virus DNA in some patirents with giant cell arteritis. Invest Ophtalmol Vis Sci 2001; 42(11):2572-7. Clokie MRJ et al. Phages in nature. Bacteriophage 2011; 1(1):31-45. Lepage et al. Dysbiosis in inflammatory bowel disease: a role for bacteriophages? Gut 2008; 57(3):424-5. Grady D. Mysterious virus that killed farmer in Kansas is identified. New York Times 2014; Dec 23. MacmullanLK et al. A new phlebovirus associated with severe febrile ilness in Missouri. N Engl J Med 2012; 367:834-41. Miller NZ, Goldman GS. Infant mortality rates regressed against number of vaccine doses routinely given: Is there a biochemical or synergistic toxicity? Hum Exp Toxicol, September 2011; 30(9):1420-1428. Allicino C et al. Acute disseminated encephalomyelitis with severe neurological outcomes following virosomal seasonal influenze vaccine. Hum Vaccin Immunother 2014;10(7):1969-73. Sin Hang lee. Detection of human papillomavirus L1gene DNA fragments in postmortem blood and spleen after Gardasil vaccination. A case report. Adv Biosc& Biotechnol 2012; 3:1214-34. Tomljenovic L et al. Human papillomavirus (HPV) Vaccines as an Option for Preventing Cervical Cancer MalignaciesHow) Effective and Safe? Current Pharmac Design 2013; 19:1466-87. Blithhstein S. Postural tachycardia syndrome following human papillomavirus vaccination. Eur J Neurol 2014; 21:130-8. Razonable RR. Antiviral drugs for viruses other than human immunodeficiency virus. Mayo Clin Proc. 2011 Oct;86(10):1009-26. Pompei et al. Glycyrrhizic acid inhibits virus growth and inactivates virus particles. Nature 1979; 281(5733):689-90. Ikeda et al. Prevention of disease progression with anti-inflammatory therapy in patients with HCV-related cirrhosis: a Markov model. Oncology 2014; 86(5-6):295-302. Fiori et al. Antiviral effects of Glycyrrhiza species. Phytother Res 2008; 22(2):141-8. Matsumoto et al. Antiviral effects of Glycyrrhizin against hepatitis C virus in vitro. PLoS One 2013; 18;8(7):e68992. Cinatl et al. Glycyrrhizin, an active component of liquorice roots, and replication of SARS-associated coronavirus Lancet 2003; 14:361(9734):2045-6. Feng Yeh et al. Water extract of licoricehad antiviral activity against human respiratory syncytial virus in human respiratory tract cell Lines. J Ethnopharmacol 2013; 9:148:466-73. Subenthiran et al. Carica papaya leaves Juice significantly accelerates the Rate of Increase in Platelet Count among patients with dengue fever and dengue haemorragic fever. Evid Based Complement Alternat Med 2013; 2013:616737. Senthilvel et al. Flavonoid from Carica papaya inhibits NS2B-NS3 protease and prevents Dengue 2 viral assembly. Bioinformation 2013; 11:9(18):889-95. Siddique et al. Eefects of papaya leaves on thrombocyte counts in dengue—a ccase report. J Pak Medic Assoc 2014; 64(3):364-6. Ahmad et al. Dengue fever treatment with Carica papaya leaves extracts. Asian Pac J Trop Biomed 2011; 1(4):330-3. Nolkemper et al. Antiviral effect of aqueous extractsfrom species Lamiaceae family against Herpes simplex virus type 1 and 2 in vitro. Planta med 2006; 72:1378-82. Koytchev R, Alken RG, Dundarov S. Balm mint extract for topical treatment of recurring herpes labialis. Phytomedicine 1999; 6(4):225-30. Roxas M, Jurenka J. Colds and influenza: a review of diagnosis and conventional, botanical and nutritional considerations. Altern Med Rev 2007; 12(1):25-4. Prasad AS. Zinc mechanisms of host defence. J Nutr 2007; 137(5):1345-9. Hadden JW. The treatment of zinc deficiency is an immunotherapy. Int J Immunopharmacol 1995; 17(9):697-701. Royal et al. Impact of zinc supplementation on subsequent growth and morbidity in Bangladeshi children with acute diarrhoea. Eur J Clin Nutr 1998; S3(7):529-34. Sazawal et al. Zinc supplementation reduces the incidence of acute lower respiratory infectionsin infants and preschool children. Pediatrcs 1998; 102(I Pt I):1-5. Bhandari et al. Effect of routine zinc supplementation on pneumonia in children aged 6 months to 3 years. BMJ 2002; 8:323(7350):1358. Klebanoff SJ. Iodination of bacteria: a bactericidal mechanism. J ExpMed 1967 1;126(6)1063-78. Dunham WB, MacNeal WJ. 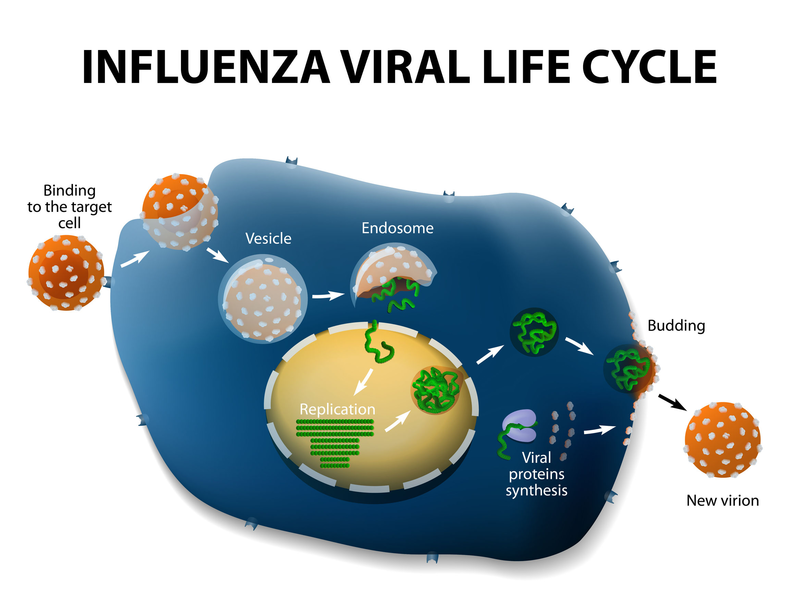 Inactivation of Influenza Virus by mild Antiseptics. J Immunol 1944; 49:123-8. Tripathy et al. Rhinofacial zygomycosis succesfully treated with oral saturated solution of potassium iodide. J Eur Acad Dermatol Venereol 2007; 21(1):117-9. Bonifaz et al. Sporotrichosis in childhood: clinical and therapeutic experience in 25 patients. Pediatr Dermatol 2007; 24(4):369-72. Griffith et al. Succes of l-lysine therapy in frequently recurrent herpes simplex infection. Treatment and profylaxis. Dermatologica 1987; 175:183-90. Milman N, Scheibel J, Jessen O. Lysine profylaxis in recurrent herpes simplex labialis: a double-blind crossover study. Acta Dermatol Venereol 1980; 60(1):85-7. McCune MA, Perry HO, Muller WM. Treatment of recurrent herpes simplex infections with L-lysine monohydrochloride. Cutis 1984 34(4):366-73. Gaby AR. Natural remedies for Herpes simplex. Altern Md Rev 2006; 11(2):93-101. Sklar et al. Herpes Zoster. The treatment and prevention of neuralgia with adenosine monophosphate. JAMA 1985; 8;253(10):1427-30. Vass et al. Adenosine and adenosine receptors in the pathomechanism and treatment of respiratory diseases. Curr med Chem 2008; 15(9):917-22. Su X, SouzaDH. Grape seed extrat for control of human enteric virusses. Appl Environ Microbiol 2011; 77(2):3982-7. Johansen et al. FDA-approved selective estrogen receptor modulators inhibit Ebola virus infection. Sci Transl Med 2013 19;5(190):190ra79. Michelow et al. High-dose mannose-binding lectin therapy for Ebola virus infection. J Infect Dis 2011; 203(2):175-9. Beck MA. Antioxidants and viral infections: host immune response and viral pathogenicity. J Am Coll Nutr 2001; 20(5S):3445-85. Beck MA. Nutritionally induced oxidative stress: effect on viral disease. J Am Coll Nutr 2000; 71(6S):1676S-815. Beck MA. Selenium and vitamin E status: impact on viral pathogenicity. J Nutr 2007; 137(5):1338-40. Hurwitz et al. Suppression of human immunodeficiency virus type 1 viral load with selenium supplementation. Arch Intern Med 2007. 22:167(2):148-54. Hughes et al. Contibutions of CTCF and DNA mzthyltransferasesnDNMT1 en DNMT3B tot Epstein Barr virus restricted latency. J Virol 2012; 86(2):1034-45. Filipowitcz et al. S-adenosyl-methionine and betainr improve early virological response in chornic hepatitis C patients with previous nonresponse. PLoS One 2010; Nov 8:5(11):e15492. Butterworth et al. Folate deficiency and cervical dysplasia. JAMA 1992; 267(4):528-33. Rönn et al. Six months Exercise intervention influences the Genome-wide DNA methylation pattern in human adipose tissue. PLos Genet 2013;9(5):e1003572. Zhu et al. A genome-wide methylation study of severe vitamin D deficiency in African American adolescents. J Pediatr 2013; 162(5):1004-9. Fetahu et al. Vitamin D and the epigenome. Front Physiol 2014; 5:164. Hiscott et al. Manipulation of of the nuclear factor-kappaB pathway and the innate immune response by viruses. ; 25(51):6844-667. Vasquez A. Nutritional an d botanical inhibition of NFκB, the Major Intracellular Amplifier of the Inflammatory Cascade. Nutr Perspect 2005; Jul:5-12. Vasquez A. New insights into fatty acid Supplementation and its Effect on Eicosanoidproduction and Genetic expression. Nutr Perspec 2005; Jan 15-16. Jariwalla et al. Restoration of blood total glutathione status and lymphocyte function following alpha-lipoic acid supplementation in patients with HIV infection. Altern Complement Med 2008; 14(2):139-46. Roxas M,Jurenka J. Colds and influenza: a review of diagnosis and conventional, botanical and nutritional considerations. Altern Med Rev 2007; 12(1):25-4. Kelly GS. Clinical applications of N-acetylcysteine. Altern Med Rev 1998; 3(2):114-27. Akerlund et al. Effect of N-acetylcysteine (NAC) treatment on HIV-I infectio: a double-blind placebo-controlled trial. Eur J Clin Pharmacol 1996; 50(6):457-61. De Flora et al. Attenuation of influenza-like symptomatology and improvement of cell-mediated immunity with long-term N-acetylcysteine treatment. Eur Respir j 1997; 10(7):1535-41. Roederer M, Ela SW, Staal FJ, Herzenberg LA. N-acetylcysteine: a new approach to anti-HIV therapy. AIDS REs Hum Retroviruses. 1992; 8(2):209-17. Vouloumanou et al. Probiotics for the prevention of respiratory tract infections: a systematic review. J AntimicrobAgents 2009; 34(3):197-el.10. Barringer et al. Effect of multivitamin and mineral supplement on infection and quality of life. A randomized, double-blind, placebo-controlledd trial. Ann Intern Med 2003; 138(5):365-71. High KP. Nutritional strategies to boost immunity and prevent infection in elderly individuals. Clin Infect Dis 2001; 33(1):1892-900. Roth et al. Acute lower respiratory infections in childhood: reducing the global burden trough nutritional interventions. Bull World Health Orfan 28008; 85(5):”(§-§’. Yamshchikov et al. Vitamin D for Treament and Prevention of Infectious Diseases: A Systematic Review of Randomized Controlled Trials. Endocr pract 2009; 2:1-29. Cannell et al. Epidemic influenza and vitamin D. epidemiol Infect 2006; 134(6):129-40. Autier P, Gandini S. Vitamin D supplementation and Total mortality: a meta-analysis of randomized controlled trials. Arch Intern Med 2007; 167(16):1730-7. Chen SSP, Steel RW. Measles. Updated sep 29, 2014. Bistrian BR. Practical recommendations for immune-enhancing diets. J Nutr 2004; 134(10 Sup):28685-725. Ziegler TR. Glutamine supplementation in cancer patients receiving bone marrow transplantation and high dose chemotherapy. J Nutr 2001; 131(9 S):25785-845. Furukawa et al. Glutamine-enhanced bacterial killing by neutrophils from postoperatieve patients. Nutrition 1997; 13(10):863-9. Jones et al. Randomized clinical outcome study of critically ill patients given glutamine supplemented enteral nutrition. Nutrition 1999 15(2):108-15. Falccao de Arruda et al. Benefits of early enteral nutrition with glutamine and probiotics in brain injury patients. Clin Scy (Lond) 2004; 106(3):287-92. Micke et al. Oral supplementation with whey proteins increases plasma glutathione levels of HIV-infected patients. Eur J Clin Invest 2001; 31(2):171-8. Micke et al. Effects of long-term supplementation with whey proteins on plasma glutathione levels of HIV-infected patients. Eur J Nutr 2002; 41(1):12-8. Moreno et al. Features of whey protein concentrate supplementation in children with rapidly progressive HIV infection. J Trop Pediatr 2006; 52(1):34-8. Escames et al. Pharmacological utility of melatonin in the treament of septic shock: experimental and clinical evidence. J Pharm Pharmacol 2006; 58:1153-65. Maestroni GJ. Therapeutic potential of melatonin in immunodeficiëncy states, viral diseases, and cancer. Adv Exp Med Biol 1999; 467:217-26. Maldonado et al. The potential of melatonin in reducing morbidity-mortality after craniocerbral trauma. J Pineal Res 2007; 42(1):1-11. El-Kamry et al. A randomized controlled trial to assess the safety and efficacy of silymarin on symptoms, signs and biomarkers of acute hepatitis. Phytomedicine 2009; 16(5):391-400. Ferenci et al. Silibinin is a potent antiviral agent in patients with chronic hepatitis C not responding to pegylated interferon/ribavirin therapy. Gastrenterology 2008; 135(5):1561-7. Massimiliano et al. Role of bromelain in the treament of patients with pityriasis lichenoides chronica. J Dermatolog Treat 2007; 18(4):219-22. Zavadova et al. Stimulation of reactive oxygen species production and cytotoxicity in human neutrophils in vitro and after oral administration of a polyenzyme preparation. Cancer Biother 1995; 10(2):147-52. Noll et al. Adjunctive osteopathic manipulative therapy in the elderly hospitalized with pneumonia. J Am Osteopath Assoc 1999; 99(3)/143-6, 151-2. Mills et al. The use of osteopathic manipulative treatment as adjuvant therapy in children with recurrent otitis media. Arch Pediatr Adolesc Med 2003; 157(9):861-6.